One of the biggest stumbling block for a newbie to install Linux on a machine with Windows on it is partitioning the hard drive. Partitioning a disk is tricky without the added pressure of knowing that if you mess something up, you risk losing a working installation of Windows as well. Here's the good news - Ubuntu has made it really easy. Apart from the partitioning window, things don't get too complicated when installing Ubuntu. Here's how to go about it. 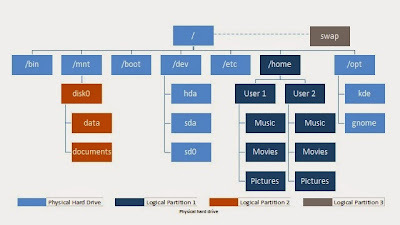 The folder structure itself acts as a organizing system for logical partitions in Linux whereas the partitions act as the base for the folder structure in Windows. This means that teh entire hard disk (the physical partition) needs a mount point too. This is the root folder (/). In the root folder, you will find mount points for the other logical partitions (they could be a folder in the root folder or a sub-folder within a folder too). In the example above, /home is the mount point for a logical partition and becomes the root folder for that particular partition. The first partition is the one allocated for Windows with 50GB labelled "Windows". A root partition for Linux of about 50GB with / as the mount point. 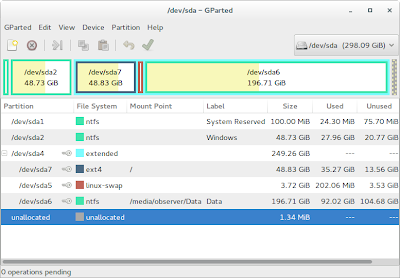 A data partition with "/media/observer/data" as the mount point but partitioned as NTFS which both Windows and Linux can use for storing data. This is the only tricky portion in installing Linux. The rest is as easy as falling off a log! For more detailed information, check Ubuntu's official documentation on partitioning your hard drive. This document provides a clear explanation of what partitions are, how to use them and what to do when installing Ubuntu. I also found a very useful and very easy instructable on doing this, which you can access here. This includes a very detailed and step-by-step process on dual-booting Ubuntu with Windows 7.